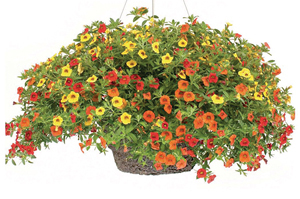 Our ‘Belle of the Ball’™ Proven Winners® Combination is made up entirely of Superbells® Calibrachoa, which may be known to you as Million Bells. All will trail or cascade beautifully and will be covered with non-stop blooms from spring through the first frost. Superbells Scarlet, Saffron and Dreamsicle combine for a daring and eye-catching visual display! This is a sun-loving combination flower design that is all about color! The Saffron base color provides the perfect background for the Scarlet and Dreamsicle thrillers with the orangey-red throats of the Saffron tying it all together! The plants in our 'Belle of the Ball' plants are grown and shipped in fine quality growing medium and are guaranteed to arrive alive and ready to thrive.